The city of Athens (Ancient Greek: Ἀθῆναι, Athênai [a.tʰɛ̂ː.nai̯]; Modern Greek: Αθήναι Athine [a.ˈθi.ne̞] or, more commonly and in singular, Αθήνα Athina [a. 'θi.na]) during the classical period of Ancient Greece (480–323 BC) was the major urban center of the notable polis (city-state) of the same name, located in Attica, Greece, leading the Delian League in the Peloponnesian War against Sparta and the Peloponnesian League. Athenian democracy was established in 508 BC under Cleisthenes following the tyranny of Isagoras. This system remained remarkably stable, and with a few brief interruptions remained in place for 180 years, until 322 BC (aftermath of Lamian War). The peak of Athenian hegemony was achieved in the 440s to 430s BC, known as the Age of Pericles. Delian League ("Athenian Empire") shown in yellow, Athenian territory shown in red, situation in 431 BC, before the Peloponnesian War. 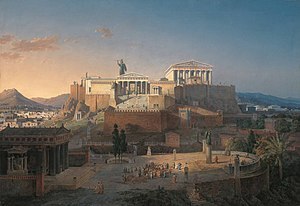 In the classical period, Athens was a center for the arts, learning and philosophy, home of Plato's Akademia and Aristotle's Lyceum, Athens was also the birthplace of Socrates, Plato, Pericles, Aristophanes, Sophocles, and many other prominent philosophers, writers and politicians of the ancient world. It is widely referred to as the cradle of Western Civilization, and the birthplace of democracy, largely due to the impact of its cultural and political achievements during the 5th and 4th centuries BC on the rest of the then-known European continent. Hippias, son of Peisistratus, had ruled Athens jointly with his brother, Hipparchus, from the death of Peisistratus c527. Following the assassination of Hipparchus c514, Hippias took on sole rule, and in response to the loss of his brother, became a worse leader and increasingly disliked. Hippias exiled 700 of the Athenian noble families, amongst them Cleisthenes' family, the Alchmaeonids. Upon their exile, they went to Delphi, and Herodotus says they bribed the Pythia to always tell visiting Spartans that they should invade Attica and overthrow Hippias. This, supposedly, worked after a number of times, and Cleomenes led a Spartan force to overthrow Hippias, which succeeded, and instated an oligarchy. Cleisthenes disliked the Spartan rule, along with many other Athenians, and so made his own bid for power. The result of this was democracy in Athens, but considering Cleisthenes' motivation for using the people to gain power, as without their support, he would have been defeated, and so Athenian democracy may be tinted by the fact its creation served greatly the man who created it. The reforms of Cleisthenes replaced the traditional four Ionic "tribes" (phyle) with ten new ones, named after legendary heroes of Greece and having no class basis, which acted as electorates. Each tribe was in turn divided into three trittyes (one from the coast; one from the city and one from the inland divisions), while each trittys had one or more demes (see deme) – depending on their population – which became the basis of local government. The tribes each selected fifty members by lot for the Boule, the council which governed Athens on a day-to-day basis. The public opinion of voters could be influenced by the political satires written by the comic poets and performed in the city theaters. The Assembly or Ecclesia was open to all full citizens and was both a legislature and a supreme court, except in murder cases and religious matters, which became the only remaining functions of the Areopagus. Most offices were filled by lot, although the ten strategoi (generals) were elected. Prior to the rise of Athens, Sparta, a city-state with a militaristic culture, considered itself the leader of the Greeks, and enforced a hegemony. The silver mines of Laurion contributed significantly to the development of Athens in the 5th century BC, when the Athenians learned to prospect, treat, and refine the ore and used the proceeds to build a massive fleet, at the instigation of Themistocles. In 499 BC Athens sent troops to aid the Ionian Greeks of Asia Minor, who were rebelling against the Persian Empire (see Ionian Revolt). This provoked two Persian invasions of Greece, both of which were repelled under the leadership of the soldier-statesmen Miltiades and Themistocles (see Persian Wars). In 490 the Athenians, led by Miltiades, prevented the first invasion of the Persians, guided by king Darius I, at the Battle of Marathon. In 480 the Persians returned under a new ruler, Xerxes I. The Hellenic League led by the Spartan King Leonidas led 7,000 men to hold the narrow passageway of Thermopylae against the 100,000–250,000 army of Xerxes, during which time Leonidas and 300 other Spartan elites were killed. Simultaneously the Athenians led an indecisive naval battle off Artemisium. However, this delaying action was not enough to discourage the Persian advance which soon marched through Boeotia, setting up Thebes as their base of operations, and entered southern Greece. This forced the Athenians to evacuate Athens, which was taken by the Persians, and seek the protection of their fleet. Subsequently, the Athenians and their allies, led by Themistocles, defeated the Persian navy at sea in the Battle of Salamis. Xerxes had built himself a throne on the coast in order to see the Greeks defeated. Instead, the Persians were routed. Sparta's hegemony was passing to Athens, and it was Athens that took the war to Asia Minor. These victories enabled it to bring most of the Aegean and many other parts of Greece together in the Delian League, an Athenian-dominated alliance. Pericles – an Athenian general, politician and orator – distinguished himself above the other personalities of the era, men who excelled in politics, philosophy, architecture, sculpture, history and literature. He fostered arts and literature and gave to Athens a splendor which would never return throughout its history. He executed a large number of public works projects and improved the life of the citizens. Hence, he gave his name to the Athenian Golden Age. Silver mined in Laurium in southeastern Attica contributed greatly to the prosperity of this "Golden" Age of Athens. During the time of the ascendancy of Ephialtes as leader of the democratic faction, Pericles was his deputy. When Ephialtes was assassinated by personal enemies, Pericles stepped in and was elected general, or strategos, in 445 BC; a post he held continuously until his death in 429 BC, always by election of the Athenian Assembly. The Parthenon, a lavishly decorated temple to the goddess Athena, was constructed under the administration of Pericles. 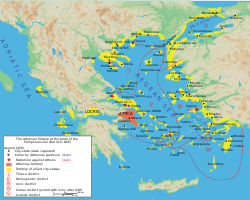 Resentment by other cities at the hegemony of Athens led to the Peloponnesian War in 431, which pitted Athens and her increasingly rebellious sea empire against a coalition of land-based states led by Sparta. The conflict marked the end of Athenian command of the sea. The war between Athens and the city-state Sparta ended with an Athenian defeat after Sparta started its own navy. Athenian democracy was briefly overthrown by the coup of 411, brought about because of its poor handling of the war, but it was quickly restored. The war ended with the complete defeat of Athens in 404. Since the defeat was largely blamed on democratic politicians such as Cleon and Cleophon, there was a brief reaction against democracy, aided by the Spartan army (the rule of the Thirty Tyrants). In 403, democracy was restored by Thrasybulus and an amnesty declared. Sparta's former allies soon turned against her due to her imperialist policies, and Athens's former enemies, Thebes and Corinth, became her allies. Argos, Thebes and Corinth, allied with Athens, fought against Sparta in the decisive Corinthian War of 395–387 BC. Opposition to Sparta enabled Athens to establish a Second Athenian League. Finally Thebes defeated Sparta in 371 in the Battle of Leuctra. However, other Greek cities, including Athens, turned against Thebes, and its dominance was brought to an end at the Battle of Mantinea (362 BC) with the death of its leader, the military genius Epaminondas. By mid century, however, the northern Greek kingdom of Macedon was becoming dominant in Athenian affairs. In 338 BC the armies of Philip II defeated Athens at the Battle of Chaeronea, effectively limiting Athenian independence. During the winter of 338 BC /337 BC Macedonia, Athens and other Greek states became part of the League of Corinth. Further, the conquests of his son, Alexander the Great, widened Greek horizons and made the traditional Greek city state obsolete. Antipater dissolved the Athenian government and established a plutocratic system in 322 BC (see Lamian War and Demetrius Phalereus). In the 2nd century BC, following the Battle of Corinth (146 BC), Greece was absorbed into the Roman Republic as part of the Achaea Province. Athens remained a wealthy city with a brilliant cultural life, but after the Siege of Athens and Piraeus (87–86 BC) by Sulla ceased to be an independent power. Map of ancient Athens showing the Acropolis in middle, the Agora to the northwest, and the city walls. The City, properly so called, divided into The Upper City or Acropolis, and The Lower City, surrounded with walls by Themistocles. The port city of Piraeus, also surrounded with walls by Themistocles and connected to the city with the Long Walls, built under Conon and Pericles. The city was surrounded by defensive walls from the Bronze Age and they were rebuilt and extended over the centuries. In addition the Long Walls consisted of two parallel walls leading to Piraeus, 40 stadia long (4.5 miles, 7 km), running parallel to each other, with a narrow passage between them and, furthermore, a wall to Phalerum on the east, 35 stadia long (4 miles, 6.5 km). There were therefore three long walls in all; but the name Long Walls seems to have been confined to the two leading to the Piraeus, while the one leading to Phalerum was called the Phalerian Wall. The entire circuit of the walls was 174.5 stadia (nearly 22 miles, 35 km), of which 43 stadia (5.5 miles, 9 km) belonged to the city, 75 stadia (9.5 miles, 15 km) to the long walls, and 56.5 stadia (7 miles, 11 km) to Piraeus, Munichia, and Phalerum. The Acropolis, also called Cecropia from its reputed founder, Cecrops, was a steep rock in the middle of the city, about 50 meters high, 350 meters long, and 150 meters wide; its sides were naturally scarped on all sides except the west end. It was originally surrounded by an ancient Cyclopean wall said to have been built by the Pelasgians. At the time of the Peloponnesian war only the north part of this wall remained, and this portion was still called the Pelasgic Wall; while the south part which had been rebuilt by Cimon, was called the Cimonian Wall. On the west end of the Acropolis, where access is alone practicable, were the magnificent Propylaea, "the Entrances," built by Pericles, before the right wing of which was the small Temple of Athena Nike. The summit of the Acropolis was covered with temples, statues of bronze and marble, and various other works of art. Of the temples, the grandest was the Parthenon, sacred to the "Virgin" goddess Athena; and north of the Parthenon was the magnificent Erechtheion, containing three separate temples, one to Athena Polias, or the "Protectress of the State," the Erechtheion proper, or sanctuary of Erechtheus, and the Pandroseion, or sanctuary of Pandrosos, the daughter of Cecrops. Between the Parthenon and Erechtheion was the colossal Statue of Athena Promachos, or the "Fighter in the Front," whose helmet and spear was the first object on the Acropolis visible from the sea. The lower city was built in the plain around the Acropolis, but this plain also contained several hills, especially in the southwest part. On the west side the walls embraced the Hill of the Nymphs and the Pnyx, and to the southeast they ran along beside the Ilissos. On the West side: Dipylon, the most frequented gate of the city, leading from the inner Kerameikos to the outer Kerameikos, and to the Academy. The Sacred Gate, where the sacred road to Eleusis began. The Knight's Gate, probably between the Hill of the Nymphs and the Pnyx. The Piraean Gate, between the Pnyx and the Mouseion, leading to the carriage road between the Long Walls to the Piraeus. The Melitian Gate, so called because it led to the deme Melite, within the city. On the South side: The Gate of the Dead in the neighbourhood of the Mouseion. The Itonian Gate, near the Ilissos, where the road to Phalerum began. On the East side: The Gate of Diochares, leading to the Lyceum. The Diomean Gate, leading to Cynosarges and the deme Diomea. On the North side: The Acharnian Gate, leading to the deme Acharnai. The Inner Kerameikos, or "Potter's Quarter," in the west of the city, extending north as far as the Dipylon gate, by which it was separated from the outer Kerameikos; the Kerameikos contained the Agora, or "market-place," the only one in the city, lying northwest of the Acropolis, and north of the Areopagus. The deme Melite, in the west of the city, south of the inner Kerameikos. The deme Skambonidai, in the northern part of the city, east of the inner Kerameikos. The Kollytos, in the southern part of the city, south and southwest of the Acropolis. Koele, a district in the southwest of the city. Limnai, a district east of Melite and Kollytos, between the Acropolis and the Ilissos. Diomea, a district in the east of the city, near the gate of the same name and the Cynosarges. Agrai, a district south of Diomea. The Areopagus, the "Hill of Ares," west of the Acropolis, which gave its name to the celebrated council that held its sittings there, was accessible on the south side by a flight of steps cut out of the rock. The Hill of the Nymphs, northwest of the Areopagus. The Pnyx, a semicircular hill, southwest of the Areopagus, where the ekklesia (assemblies) of the people were held in earlier times, for afterwards the people usually met in the Theatre of Dionysus. The Mouseion, "the Hill of the Muses," south of the Pnyx and the Areopagus. The Piraean Street, which led from the Piraean gate to the Agora. The Panathenaic Way, which led from the Dipylon gate to the Acropolis via the Agora, along which a solemn procession was made during the Panathenaic Festival. The Street of the Tripods, on the east side of the Acropolis. Temples. Of these the most important was the Olympieion, or Temple of Olympian Zeus, southeast of the Acropolis, near the Ilissos and the fountain Callirrhoë, which was long unfinished, and was first completed by Hadrian. The Temple of Hephaestus, located to the west of the Agora. The Temple of Ares, to the north of the Agora. Metroon, or temple of the mother of the gods, on the west side of the Agora. Besides these, there was a vast number of other temples in all parts of the city. The Bouleuterion (Senate House), at the west side of the Agora. The Tholos, a round building close to the Bouleuterion, built c. 470 BC by Cimon, which served as the Prytaneion, in which the Prytaneis took their meals and offered their sacrifices. Stoae, or Colonnades, supported by pillars, and used as places of resort in the heat of the day, of which there were several in Athens. In the Agora there were: the Stoa Basileios, the court of the King-Archon, on the west side of the Agora; the Stoa Eleutherios, or Colonnade of Zeus Eleutherios, on the west side of the Agora; the Stoa Poikile, so called because it was adorned with fresco painting of the Battle of Marathon by Polygnotus, on the north side of the Agora. Theatres. The Theatre of Dionysus, on the southeast slope of the Acropolis, was the great theatre of the state. Besides this there were Odeons, for contests in vocal and instrumental music, an ancient one near the fountain Callirrhoë, and a second built by Pericles, close to the theatre of Dionysius, on the southeast slope of the Acropolis. The large odeon surviving today, the Odeon of Herodes Atticus was built in Roman times. Panathenaic Stadium, south of the Ilissos, in the district Agrai, where the athletic portion of the Panathenaic Games were held. The Argyrocopeum (mint) appears to have been in or adjoining the chapel (heroon) of a hero named Stephanephorus. The Outer Kerameikos, northwest of the city, was the finest suburb of Athens; here were buried the Athenians who had fallen in war, and at the further end of it was the Academy, 6 stadia from the city. Cynosarges, east of the city, across the Ilissos, reached from the Diomea gate, a gymnasium sacred to Heracles, where the Cynic Antisthenes taught. Lyceum, east of the city, a gymnasium sacred to Apollo Lyceus, where Aristotle taught. The Karyatides statues of the Erechtheion on its Acropolis. ^ "Plato's Academy". Hellenic Ministry of Culture. www.culture.gr. Archived from the original on 2007-03-21. Retrieved 2007-03-28. ^ CNN & Associated Press (1997-01-16). "Greece uncovers 'holy grail' of Greek archeology". CNN.com. Archived from the original on April 4, 2005. Retrieved 2007-03-28. ^ "Ancient History in depth The Democratic Experiment". BBC. Retrieved 2007-12-26. ^ Encarta: Ancient Greece. Retrieved on 26 January 2007. Archived 2009-10-31. ^ Translated Robin Waterfield, Herodotus (1998). The Histories. Oxford University Press. ^ Henderson, J. (1993) Comic Hero versus Political Elite pp.307–19 in Sommerstein, A.H; S. Halliwell; J. Henderson; B. Zimmerman, eds. (1993). Tragedy, Comedy and the Polis. Bari: Levante Editori. ^ Camp, John. The Archaeology of Athens. Yale University Press.